Fri. January 7th 2011 at 6:30 p.m.
Bellville, Ohio (just south of Mansfield) — at Pumpkin Hollow Antiques and Cafe, 14 Bell Street. Dianne Borsenik and I will be featured poets. The evening will also include featured music by guitarist Andy Roberts and an open mic emceed by Ohio Poetry Association president Mark Hersman. More info here. Thurs. January 20th at 7 p.m.
Avon Lake, Ohio — at the Avon Lake Public Library, 32649 Electric Blvd. Robert Miltner and I will be featured poets as Poets of Lorain County kick off a new monthly series. The event will begin with an open mic. More info here. Fri. January 28th at 6:30 p.m.
Lorain, Ohio — at the 737 Gallery (home of the Lorain Arts Council), located at 737 Broadway Ave. Featured Lorain County poets will include Eric Anderson, Robert Miltner, Elise Geither, Shelley Chernin, Dianne Borsenik and me. Other featured performers that evening will include internationally known Nepali poet Yuyutsu R.D. Sharma, music and spoken word duo Trenchcoat Manifesto (Richard Hearn and Tom Adams), Cleveland poet Marilyn Oliveras de Ortiz, bomba y plena (Afro-Carribean song and dance) by Rafael Rivera and Manancique, and a unique dance/music performance of “Echo” and perhaps other works by La Mariposa (Amy Compton) and Michael McNamara. More info here. February 2nd at 5 p.m. thru February 8th at 11 p.m.
Elyria, Ohio — at Jim’s Coffeehouse and Diner, 2 Kerstetter Way, I will be but one of probably hundreds of poets sharing their work as Lix and Kix presents Snoetry II: A World Record Winter Wordfest. This event will run for 150 hours straight, smashing the mark for longest poetry reading ever (120 hours) set in 2010 out Kansas City way. More info here. Sat. March 26th at 7 p.m.
Erie, Pennsylvania — at Poets Hall, 1136 E. Lake Road. Erie’s own Chuck Joy and I will be featured poets during the Invited Artist series hosted by Cee Williams and the International Fellowship of Poets & Spoken Word Artists PA Local 1136. Toledo, Ohio — I will be one many poets and all sorts of other artists performing during the annual Artomatic419 festival in Toledo. I’m not sure exactly what times I’ll be performing yet (Artomatic419 takes place on three successive Saturdays), but I’ll let you know as soon as I do. Mon. May 23rd at 7 p.m.
Athens, Ohio — at Abrio’s Brick Oven, 859 East State Street, Dianne Borsenik and I will be featured poets during an event hosted by the Poets South of I-70. An open mic will be part of the festivities. Sat. May 28th at 5 p.m.
Wapakoneta, Ohio — at the Temple of Tolerance, 203 S. Wood Street. I’ll be one of the featured poets during a reading at this unique and inspiring venue. I’ll also be reading in Pittsburgh, PA and Richwood, WV in the new year. I’ll post dates and details as soon as they’re confirmed. This Sunday, January 2nd from 1 to 3 p.m. at Jim’s Coffeehouse and Diner, 2 Kerstetter Way in Elyria, Ohio, PoetryElyria will present featured poets Anne McMillen and Shelley Chernin. This event includes an open mic emceed by yours truly. she’s enjoying the measurement of snowfall in inches rather than feet. Bowling Green State University until I dropped out to focus on writing. published books of poems and am working on my first full length novel. John Burroughs of Lix and Kix will emcee. So I’m listening to it again. call it a sol stitch. On Sunday December 26th from 1 to 3 pm, PoetryElyria presents an open mic followed by performances by featured poets Clarissa Jakobsons (from Aurora, Ohio) and Cameron Conaway (from Altoona, Pennsylvania, in his first ever Cleveland area reading)! It all happens at Jim’s Coffeehouse and Diner, 2 Kerstetter Way in Elyria, Ohio. detention center. For more information visit www.CameronConaway.com. exhibited paintings at Akron Art Museum and Kent State University. weights on Treasure Island, or walking under an Ohio crescent moon. poet, and Ethics professor at University of Maine. and Kix Poetry Extravaganza will emcee. This Sunday, December 19th 2010 from 1 to 3 pm, PoetryElyria is pleased to present featured readings/performances by Steven B. Smith and Courtenay Roberts at Jim’s Coffeehouse and Diner, 2 Kerstetter Way in Elyria, Ohio. The festivities will begin with an open mic where all are welcome and encouraged to share. I first became enamored of Courtenay Roberts‘ work through the Pudding House Salon-Cleveland workshop we’re both part of in Cleveland Heights. I still have a hard time believing she’s not done a feature anywhere before, and I’m thrilled that she’s agreed to do her first here with us in Elyria. I first became a fan of Steven B. Smith‘s work through the MySpace versions of his and his wife’s blog. If not for his influence or inspiration, I may never have gone to my first poetry reading, started taking photos at and videoing as many events as I do, and maybe there wouldn’t even be a Crisis Chronicles Online Library. Having him read for PoetryElyria is an honor. from the local used bookshop or laughing at her own very unfunny jokes. searching for a practical use for her degree in English ever since. critically acclaimed book Zen Over Zero: Selected Poems 1964-2008.
blogging about the best, worst and most unique bits of their journey at http://walkingthinice.com. I’m not sure what the best title for this is. All I keep thinking of are musical references — “Stoned immaculate” by Jim Morrison; “Not necessarily stoned, but beautiful” by Jimi Hendrix (or my variation: not necessarily beautiful, but stoned); “Too Rolling Stoned” by Robin Trower; and even “I get by with a little help from my friends” (don’t ask). I will say, however, and quite honestly, that I haven’t smoked marijuana in many years — so the stoned references aren’t about that (to me, that’s obvious, but maybe not to others). I don’t have anything against weed — but to think this poem has anything to do with it misses the point(s). 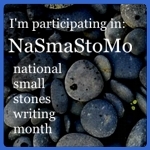 Fiona Robyn came up with this daily writing project and I plan to participate by writing at least one “small stone” each day throughout the month of January 2011. Find more details here: http://ariverofstones.blogspot.com. Today, while looking to see if my step-father left his torch in our basement, I discovered that our hot water tank was leaking. Since he’s a plumber, I called him and he immediately came over and fixed it (thank you! ).